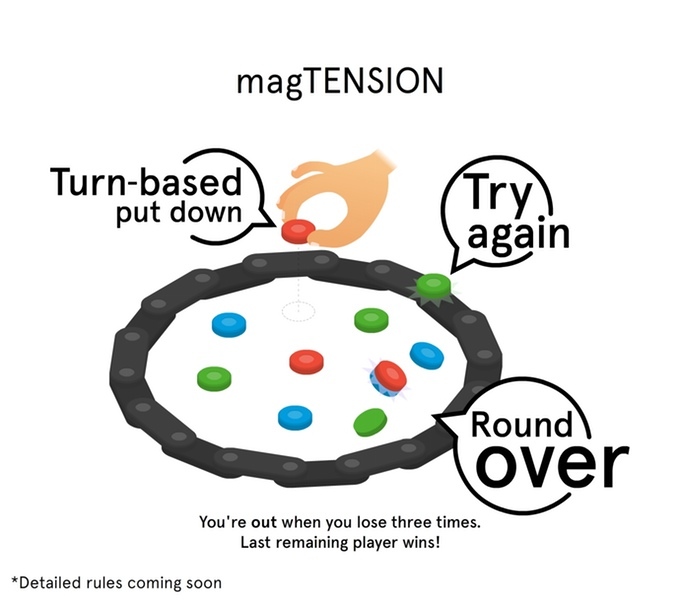 I get notified about a lot of Kickstarter projects and I thought I would post a quick message about one particular one that caught my eye called Magination, It is a set of magnetic pieces which contain one, two or three very powerful magnets in each and various games can be played with these. One example called MagTension is to set up a ring of 2-magnet pieces and then take turns placing 1-magnet pieces inside the ring – the first person to place one that attracts others not only loses the game (so it’s a bit like the magnetic equivalent of Jenga) but it can cause a chain reaction of the magnets bouncing around attracting more and more and finally sticking to the ring. It looks very cool in practice. Another use is to use a piece containing 3 magnets to flick a 1-magnet piece across the table using the repelling magnetic fields. Rather than try and describe it further, check out the main video on their Kickstarter page which does show it off very well indeed (and conveys it much better than pure text). Some of the chain reactions are great. The Kickstarter has already funded (by 6 times) but has only 60 hours remaining if you want to get involved. 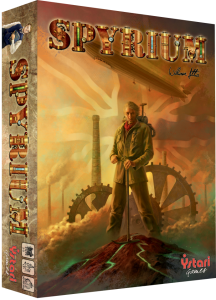 Spiel in Essen is now less than 3 months away so the information about (and the buzz around) games being released there has begun. It’s always an exciting time of year as lots of new games get announced in the lead-up to the event in October. I will be looking to do the same as I did last year and post short previews of games that catch my interest. As it’s not possible to write a preview of every interesting game (plus, I notice some games some time before I’m able to post a preview), my Spiel 2014 page will show a full list of all the games I find interesting (whether previewed or not) and links to any previews I’ve posted. City of Zombies is a co-operative, dice-allocating game where players are trying to stop wave after wave of zombies from attacking the city. 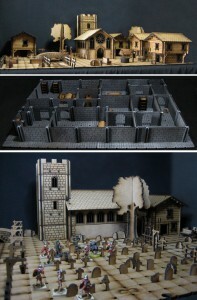 This is a Kickstarter project that is live at the moment. The game was designed by Matt Tidbury to help his daughter with her arithmetic and, since then, Matt has had a great deal of excellent and positive feedback from the many schools where he has tested it with kids, as well as adult education centres and even a prison too. Whilst the game is intended to help kids with their number skills, it offers a fun game challenge too. Players take turns rolling 3 dice and they can then allocate them to zombies which each have a target number on them in order to destroy them. 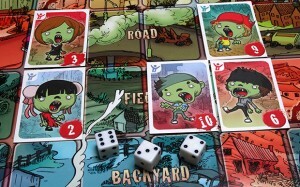 The tricky part is that to kill a zombie, a player must use the values of the dice to match the target number on each zombie AND no dice can be left unused. So, if you roll a 2, 4 and 5, you could add these all together to make 11 and kill one zombie with value 11, or multiply the 2 and 4 to make 8 and kill one zombie with value 8 and another zombie with value 5, etc. Remember, every dice must be used in some way or no zombies can be removed by that player. After each player has had a turn, the zombies advance towards the city and more zombies arrive at the top of the board. Image of prototype from Cliquenabend’s preview video. Click on the image to watch the video. Bruxelles 1893 is a worker placement game with lots of game mechanics going on. 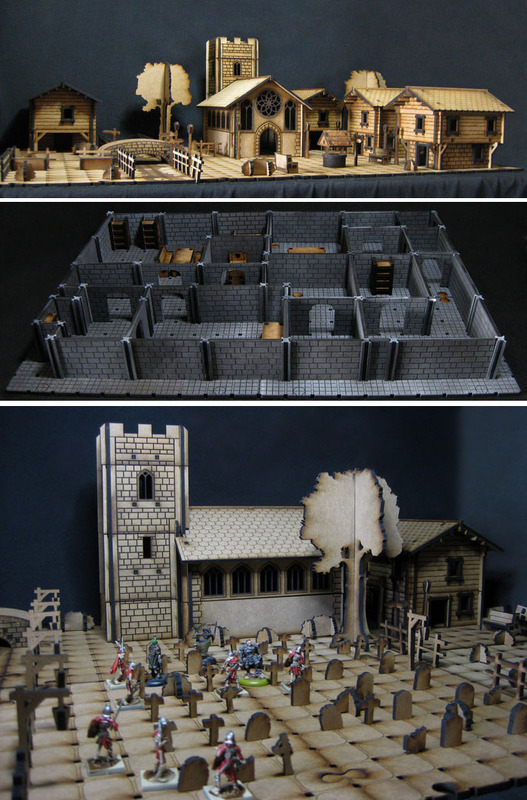 The setting is that players architects who are building Bruxelles in 1893. The board is divided into two areas: the Bruxelles board and the Art Nouveau board. 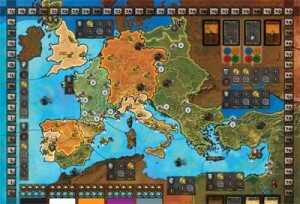 Worker placement on the Bruxelles board locations is free (no coins); however, if a player wants to place on a location occupied by another worker, they must place one more worker than those already there; however, these extra workers go to jail/court when the player takes the action. So, you can potentially use any action on the Bruxelles board but it may cost you workers. The locations for workers on the Art Nouveau board is a grid and players must add coins to their workers when placing there. The players with the most total coins in a column at the end of a round takes that column’s bonus card which can be used for either an instant bonus or saved for an end of point scoring effect. Rockwell is a mining game which mixes a little bit of worker placement (as you place your vice presidents at the start of each round to gain different advantages in the drilling phase) with tactical moving of your drilling crews. Drilling is a often a joint effort by multiple players – if there are enough drilling crews of enough total strength on a tile then the resources recovered are revealed and shared between the players present (regardless of the amount of crews they have there). Splitting the resources gained is intriguing as the players involved share out as much as they can so they have the same and any remainder is given to the player with the ‘priority’. Players can move other players’ crews by bribing them, or they can pay to hire temporary crews (who don’t take a share of any gains). Players can sell what they mine and buy other resources like improved drilling crews, permanent mine shafts and safety equipment. Each player is attempting to complete some of the achievements which score fewer victory points if other players have already completed them too. 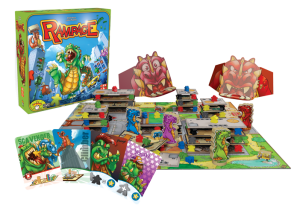 Rampage is a dexterity game of giant Godzilla-like monsters smashing their way through a city. Each player controls a monster which consists of a wooden disk for feet, with a wooden body/head section on top. The city is divided into different neighbourhoods and buildings are built out of card layers with meeple as the supports between floors. That may sound kind of normal but the game actually based on flicking, dropping and blowing. Each turn, monsters get 2 actions. To move your monster, you flick the feet disc. To attack buildings, take your monster piece and drop it onto a building. To blow a building down, place your chin on your monster piece and blow. To throw a vehicle, place the vehicle piece on top of your monster and flick it. Players get to eat any loose meeple in their current neighbourhood. Also, monsters can attack each other too – a successful attack removes one of their teeth which reduces how many meeple a monster can eat during a turn and are worth points too. Each monster has a special ability as well as some other powers. 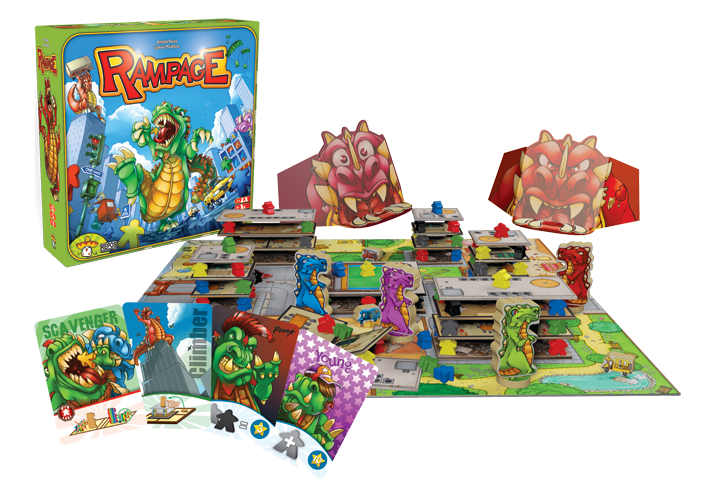 Each player has a monster screen behind which they hide the meeple and monster teeth they gain, but rather than simply place items here (because that would be far too normal), players push items through the mouth slot in the screen. Nice. Spyrium caught my attention from the gameplay description. 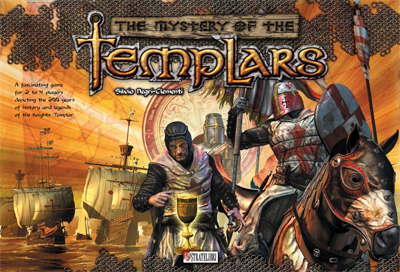 It was only after that that I discovered it is designed by the creator of Caylus and Caylus Magna Carta (the latter being one of me favourite games). So, this doubly interested me. 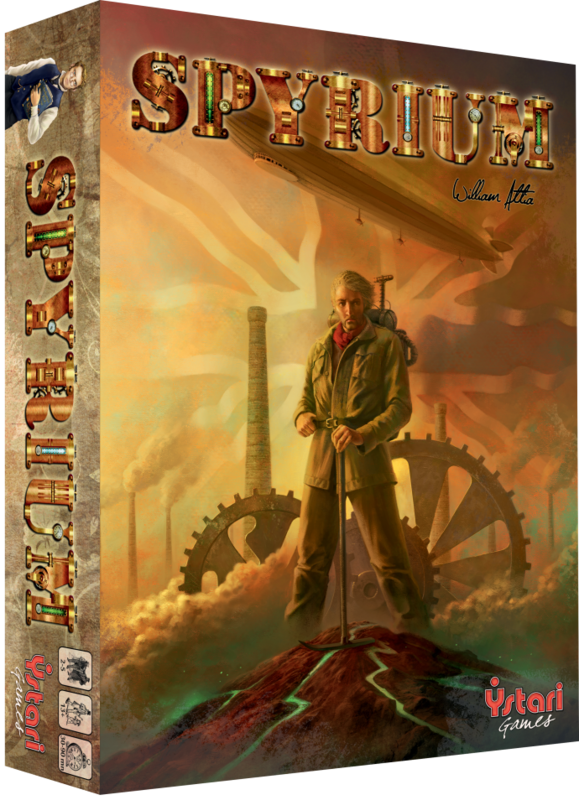 The game has steampunk-ish setting and players are each head of an industrial conglomerate an spyrium is a mineral high in energy. The player who scores the most victory points (VPs) by the end of the game wins. Spyrium uses a clever worker placement system where players place their workers in between buildings which are laid out in a 3×3 grid. Players take turns either placing or activating a worker; however, once a player starts activating their workers, they can’t place any more during the current round, so you have to choose when to switch from one to the other. Activating a worker allows the player to use one of the two cards that the worker is positioned between, so you have a choice until you use them. The cards in the 3×3 grid are either characters (which give you one off benefits), buildings (which allow you to build your own buildings used for special effects in future turns), and patents (which give you on-going abilities plus score VPs at the end of the game too). 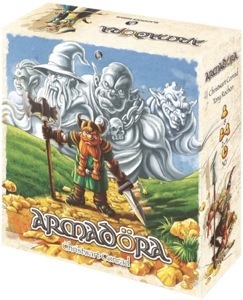 Armadöra is a new game by Blackrock Editions who published The Boss in 2011 and Blackrock City in 2012. The Boss is one of my favourite games as it has a superb information revealing/deduction game mechanic, fits a lot of game into a short play time, and fits a lot of game into a very small box. Blackrock City was quite different in gameplay and was good too, (although not as good as The Boss in my eyes). Armadöra appears to be a re-themed version of a game called Nuggets where players are trying to stake claims on gold mines. Various mines are on the board and players take turns either (a) placing their markers face-down (which have different strengths) on any empty board square, or (b) placing 2 fences between squares on the board. When an area is completely sectioned off by fences (so long as it’s large enough), the players’ markers in the area are revealed and the player with the most strength receives the gold for any mines in that section.